“Times were hard in Dallas, and certainly the NFL was not in its heyday,” recalls Jones, but that did little to stop him from spending $150 million to acquire the Cowboys. “I was intoxicated with the idea of getting to be involved in the NFL, of getting to be involved in the sports business,” he says. The franchise went from losing $ 1 million a month in 1989, to winning three Super Bowl championships in 1992, 1993 and 1995. And the world watched as they won, falling in love, just like Jones had. “The NFL had millions of fans in the United States, and the Cowboys were the most visible of all the teams,” says Jones. That hasn’t changed, even though everything else has. The Dallas Cowboys are now the third most valuable sports team in the world, worth approximately $3.2 billion, and they continue to capture the hearts of sports fans worldwide. Last year, the team played its first international, regular- season game in London against the Jacksonville Jaguars: a game the Cowboys won emphatically 31-17, as if to remind the world which team shines brightest on the Star – Spangled Banner. Home fans will be hoping to see many more wins this season when the Cowboys return to the AT&T Stadium in September to host the New York Giants in the first week of the 2015-2016 season. Confidence is high within the Cowboys organization, after an encouraging 2014-2015 that saw the team reach the playoffs for the first time since in 2009. From left to right: Hublot CEO Ricardo Guadalupe, Dallas Cowboys Owner, President and GM Jerry Jones, Dallas Cowboys Head Coach Jason Garrett and Hublot Latin America President Rick De La Croix. To be certain the Cowboys compete for another run in the playoffs, the team has spent the off-season improving the areas around its star player. “Our goal was to improve our defense, [and] we’ve done it,” says Jones. While the players had the off-season to regroup, their home continued to play host to the world’s largest stage with the 50th Annual Academy of Country Music Awards, which brought many big names in the industry including the Rolling Stones and Taylor Swift to town. Jones and Anderson know how make the biggest names feel at home inside the AT&T Stadium. But it’s not just celebrities that visit Dallas. Last summer, the NFL team announced an exclusive partnership with Hublot, making the Swiss brand the “Official Luxury Watch” & “Official Timekeeper” of America’s legendary football team. It was the very first time a luxury watch brand had partnered with an American football team, but Hublot CEO Ricardo Guadalupe says the Cowboys were a logical addition to the Hublot family. “We were the first luxury watch brand to partner with European football, so this historic partnership with ‘America’s football team’ and the Jones family is a natural extension of our philosophy,” says Guadalupe. In honor of the historic partnership with the NFL team, Hublot created three limited edition Dallas Cowboys- branded timepieces, inspired by the team’s iconic colors. Always keen to get hands-on, Jones and his daughter played a major role in the design of the watches. “You must be on the ball,” says Jones. “[Designing a luxury timepiece is hard], but you want to make it look easy,” he adds. That’s the way football is played in Texas. Jones discovered just how much research and development goes into a Hublot novelty when the Dallas Cowboys- owner visited the Swiss brand’s manufacture in Nyon, Switzerland. “When I saw the skill and craftsmanship that goes into the company’s watches, I knew there had to be something in there for my football team. I wanted to see my Dallas Cowboys on the watch,” says Jones. The Jones family meets with Hublot CEO Ricardo Guadalupe to tour the Hublot Manufacture in Nyon, Switzerland in 2014. In Switzerland, Jones met with another marketing genius, this time in the world of watches: Jean-Claude Biver, head of LVMH Watches and CEO of Hublot. There was only ever going to be one design cue for the Dallas Cowboys watch. “We had to have a focal point,” says Jones. That of course is the famous Cowboys star, which can be found on each watch at 5 o’clock. Set in diamonds in the women’s version, it pays homage to the Cowboys’ five Super Bowl wins. 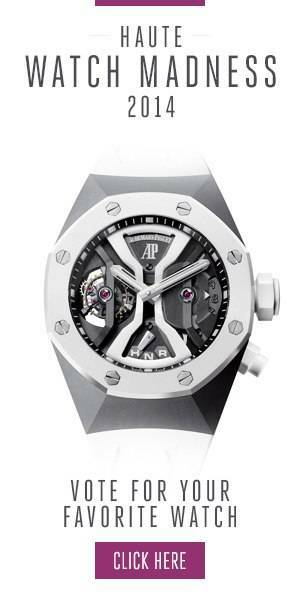 All three models—which include two Classic Fusions and a King Power—will be produced in a limited edition of 50 numbered pieces each and sold exclusively in the Dallas market, both at Hublot’s Dallas boutique and at a newly- minted pop-up location in the Cowboys’ Owner’s Lounge at AT&T Stadium. Dallas loves the Cowboys, and the team returns its hometown’s love by setting an example not only on but also off the field, raising money and awareness through a number of charity events led by Anderson this summer. “Effort, perseverance and quality.” That’s what the Dallas Cowboys star represents according to Jones, and he sees those values in the twinkle of his daughter’s eyes. Anderson, 48, is the family’s rising star. “As a young girl, she never had to be told. She was our alarm clock, always the first one up,” says Jones, who humbly revealed that his daughter takes after her mother in that way. The middle child of three, Anderson is in the twilight of her career. The first woman to ever serve as the national chairman of the Salvation Army National Advisory Board, she was appointed chairman of the NFL Foundation in 2012, and is responsible for spearheading philanthropic efforts in player care, youth football and medical research. Anderson says the watch currently sitting on her wrist celebrates those milestones. “It’s a sign of accomplishment,” she says as she looks down at her timepiece, adding that it also symbolizes the victories ahead. Like father, like daughter in the Jones family. Just like Jerry in 1989, Charlotte is showing her love for Dallas by committing her time to the Cowboys.